10 % OFF Your First Order! GIA Gemologist Elaine, the owner and designer of Esprit Creations has been called the ‘Gemstone Queen’ because she uses the best gemstones in quality, color, clarity and cut for her exclusive designs. She artistically integrates irresistible color combinations while effectively synchronizing the gemstones synergy. Esprit Creations is especially known for it’s wow-quality ethereal glowing Rainbow Moonstone and Labradorite, because “WOW” is what you will exclaim when you see it, and so will your customers. Your sales will grow and your best buyers will keep coming back for more. Elaine keeps up with the times by continuously creating new designs that sell. This year, moons and crescent moons are all the rage. Consumers are looking for jewelry with meaning to empower them. The moon symbol inspires solace, satisfaction and success. Our designs are constantly adapting and evolving, much like the crescent moon. Rings are some of our best sellers. We carry a wide range of rings from low to high end in both simple and elaborate designs. We make sure we have sizes for everyone. In some designs we start from size 4. Many smaller rings can be worn as the popular midi ring or stack ring. Our special designs for unisex and men’s rings are in great demand. For many of these we carry up to size 14. In most cases it is a myth that a store must carry one design of ring in several sizes. We highly recommend that you offer an attractive display of spectacular rings in a variety of designs, stones and sizes. This will make your rings irresistible so that your customers will make sure that they find a ring to fit one of their fingers. This has been our suggestion to new customers who were once hesitant to carry rings. Now rings have also become one of their best sellers as well. 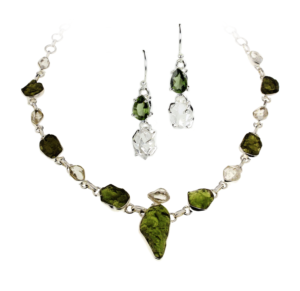 Our Moldavite and Herkimer Diamonds are a winning combination. Clear and cool natural Herkimer Diamonds soothe and balance the raw ‘Sky-meets-Earth’ energy of Moldavite, adding a touch of elegance to compliment Moldavite’s natural rough look. In a blog on our website Elaine explains the difference between genuine Moldavite and man-made moldavite. Because Moldavite has been naturally formed much like glass, through short blasts of intense heat, it is easy to imitate. We guarantee the authenticity of all our stones. Black Kyanite naturally grows in this feathery wing like formation. We have it titanium plated to enhance its subtle iridescence. Titanium is a natural metallic element found abundantly in the Earth’s crust. Titanium reflects the light and colors of nature, creating fleeting shades of indigo, emerald, copper and gold. 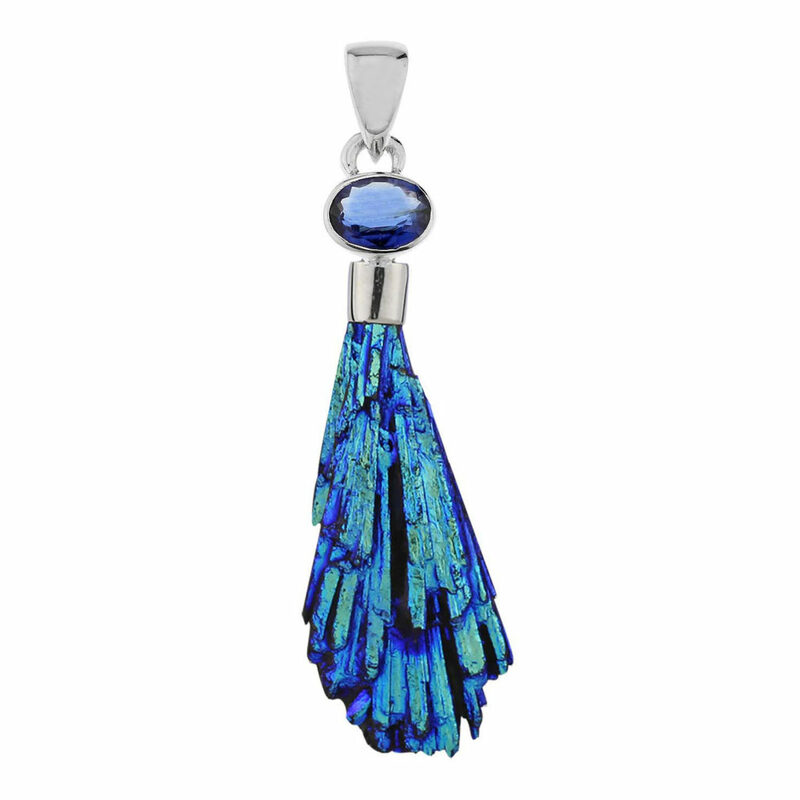 We accented natures work of art with a faceted kyanite gem to compliment it. With designs like this your store will become the talk of the town. On our website we offer free promotional cards with brief descriptions of gemstones and metaphysical symbols. You are welcome to download and use them to enhance your sales. We have thousands of Artisan designs for you to choose from to attract your customer’s different tastes and budgets. 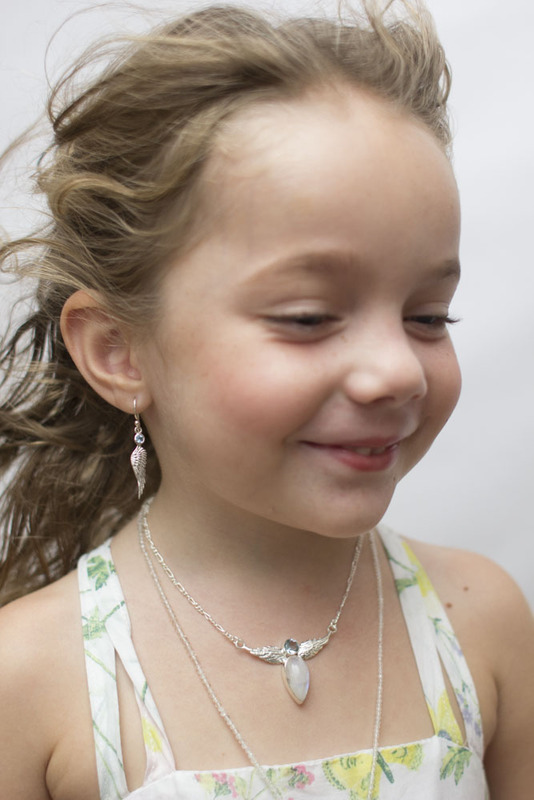 Our customers have called our lower end jewelry ‘Adorable and Affordable’. We assure the same high quality of gemstones and meticulous workmanship whether in a higher-end piece or lower-end item. We guarantee that all our jewelry is made in 92.5 Sterling Silver. View our “Under $25 Category” to see our more inexpensive jewelry designs. While every store needs its ‘bread and butter’ jewelry pieces, we suggest that you carry at least some medium to higher end items to draw shoppers to your displays. Having a few conversation pieces holds their interest in your other products. It also begins to attract more shoppers that have money to spend. Our Metaphysical Symbols cover a wide range of esoteric interests, such as Angels, Lotus, Egyptian, Nature, Celtic, offering dynamic and meaningful jewelry with aesthetic appeal. We carry the largest selection of authentic Chakra Jewelry. Each chakra design features seven specific sparkling gemstones brilliantly crafted in its own impressive sterling silver motif. Promo cards are available for Chakras and Symbols.